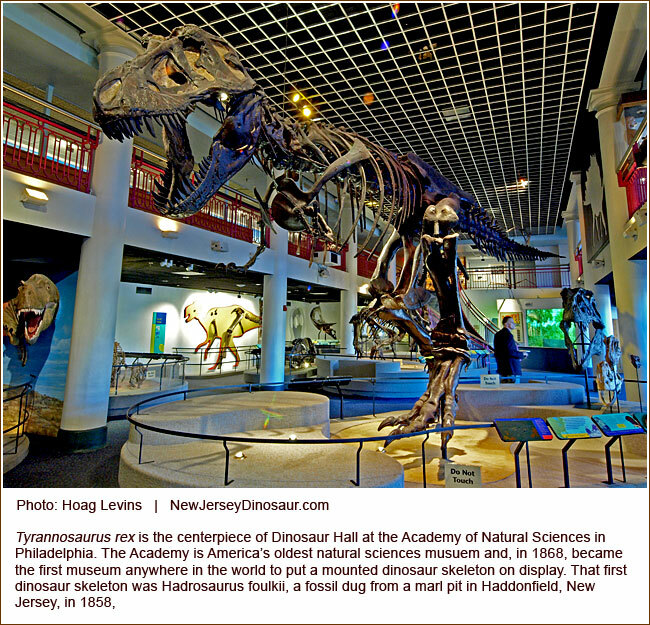 The Academy's Dinosaur Hall enables visitors to walk through a comprehensive history of prehistoric creatures. The Academy is located on one of Philadelphia's most picturesque areas. About twelve miles west of Haddonfield, the Philadelphia Academy of Natural Sciences is located just across the street from Logan Circle's famous central fountain (above, left). Along with housing one of the oldest museums of its kind in the world, the building (above, right), with its colorful banners and soaring bronze sculpture of two slashing dinosaurs, is a major landmark of center city.